Gantry cranes are used to lift and transport items around a working area in a factory or machine shop. Some workstation gantry cranes are equipped with an enclosed track, while others use an I-beam, or other extruded shapes, for the running surface (the running surface is the area the wheels of the trolley ride on, usually the wheels are a low friction material for easy movement of the hoist and trolley, IE. nylon). Most gantry cranes are intended to be stationary when under load, and movable when unloaded, usually via wheels. That is the ONLY movements while under load is with the hoist and repositioning of the crane should only be done when unloaded. Overhead workstation cranes are fixed to the building floor, ceiling, or beams in some manner and have a fixed loading area. If you need flexibility in terms of where your lifts happen, a gantry crane may be your best option. Versatility is the biggest feature of any gantry crane as they can move or be more easily disassembled and reassembled at another locaton. What size of crane are you looking for? 1 ton gantry crane? 2 ton? 3 ton? The lifting capacity is the primary consideration of any crane and dictates other considerations like wire rope or chain. Gantry cranes can be outfitted with either a wire rope hoist or a lower capacity chain hoist (higher durability) dependant on your specific needs. The hoist can be electric, or air, again, dependent on your lifting needs. Also known as “portal cranes” as the workspace the gantry straddles is known as the “portal” of the crane. A feature of some gantry cranes is the ability to change the height of the crane via adjustable columns. 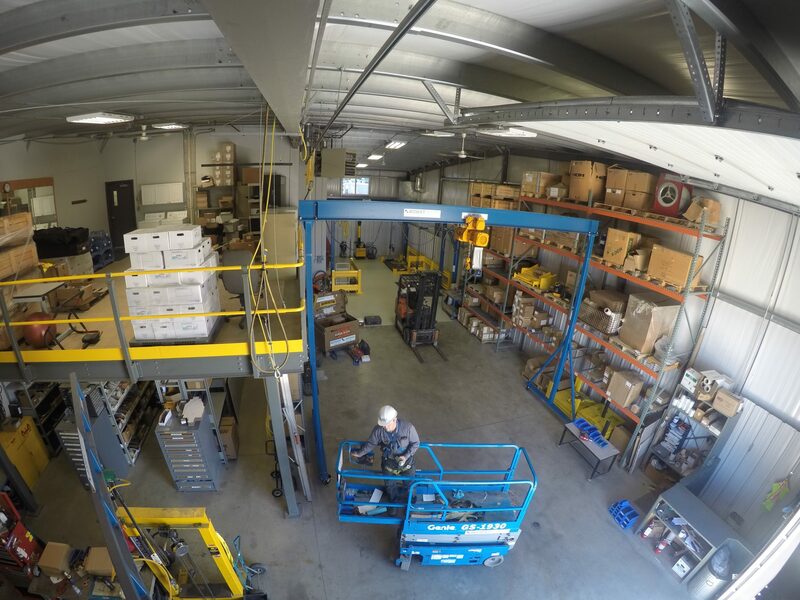 Most shops don’t adjust often but when overhead space is limited or the space changes, the ability to get more lift from your gantry crane is invaluable. An example would be in a repair shop that multi-purposes the gantry crane for engine lifts in one area and then uses it to re-position large parts in the warehouse section of the operation. You are able to change where your lifting takes place so that your business operations have more flexibility. The greatest benefit a gantry crane offers is mobility; however, if this isn’t a feature you require fixed position overhead cranes are usually your better option. Workstation cranes offer larger loads, less moving parts, and are structurally more sound. Read more about workstation cranes here. There are aluminum gantry cranes which are considerably lighter than their steel counterparts. Gantry cranes of this material can be assembled by one person and individual parts can be handled by the same. 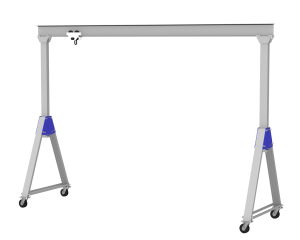 Why would you want a lightweight gantry crane? Sometimes they are needed on rooftops where weight is a consideration. Sometimes the parts are brought in by hand (or up stairs to that roof) – and that requires something that people can lift and move. We’re here to help. Contact our team of lift experts in Manitoba or in Saskatchewan and we’ll find a solution that works best for your shop or work site.